Kelantan has dense jungles, high peaks, mysterious caves, swirling rapids and is shrouded in mystery and folklore. It hides romantic and exciting adventures, your endurance is tested, your physical and mental limits are reached. It is simply breathtaking. It is an off-the-beaten destination, which have only a few travelers have discovered. But one thing is certain: you'll come back to Kelantan. 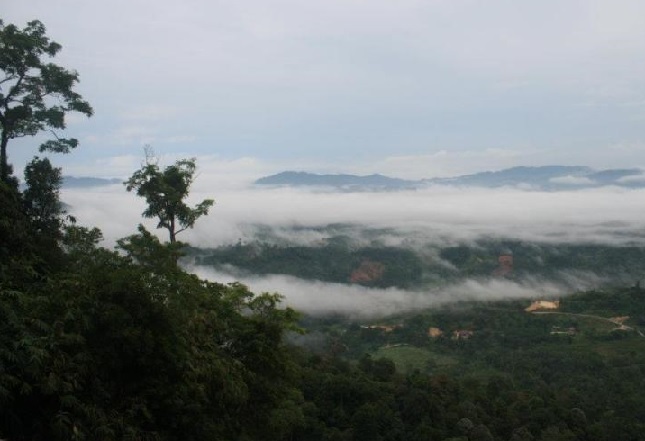 The rugged landscape of the interior of Kelantan has many exciting things to offer to adventurers. From limestone hills to rapids, from dense tropical jungles to cool, hollow caves. Kelantan is "must" for adventurers. The best way to see the interior of Kelantan and shed a first glance on the typical village life, is to take a ride in the KTM train. This romantic ride through the Jungle Train is adventurous and it drives you through the State of Kelantan. 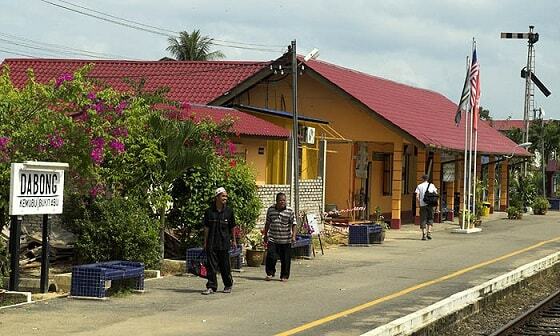 One of the stops on the way is the quaint village Dabong, about 155 kilometers from Kota Bharu, which is the capital. Dabong located in the area known as the Gunung Stong State Park (SGR) (formerly Jelawang Jungle) and it is on the edge of the massive mountain "Titiwangsa Range", which runs through the center of Malaysia. Here, in Dabong you'll get off the train. This mountainous region near Dabong has majestic mountain peaks, waiting to be climbed, like the Gunung Ayam, Gunung Stong, Tera Gunung, Gunung Saji, Koh Gunung, Gunung Baha, Gunung Beirut and Gunung Che Tahir (Gunung is the Malay word for mountain). One of the main attractions of the region is the Gunung Stong State Park (1422 meters), a dome-shaped granite top, which is over 500 million years old. Here are the seven-steps Stong Waterfall. This is the waterfall highest in Southeast Asia and the water makes a fall of about 990 feet. If you want to reach the top of the waterfall you'll have to make a trekking of about two hours. You then climb a kilometer up along steep slopes. 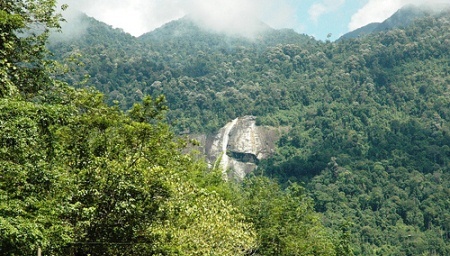 Gunung Stong State Park was opened in October 2005 State Park and is one of five unique ecotourism destinations in Malaysia. It has an area of ​​21,950 hectares and is dotted with high peaks, dense forests, a variety of caves, rivers and waterfalls. The dense jungle is home to elephants, tigers, bears, gibbons, hornbills and a range of other exotic animals. In addition, you will also find here the world's largest flower, the Rafflesia, the split bamboo, a kind of purple herb (Didymocarpus calcareous) and unique palm species (Licuala stongesis). With the help of expert guides, it's really adventurous, as he guides you on wild animals which he sees during the trek. In good weather conditions the experienced guide takes travelers past the foot of the Gunung Stong waterfall, before proceeding deeper into the dense jungle for the rest of the trekking. You can see the waterfall from nearby, cascading from a great height falls. It is a breathtaking sight. 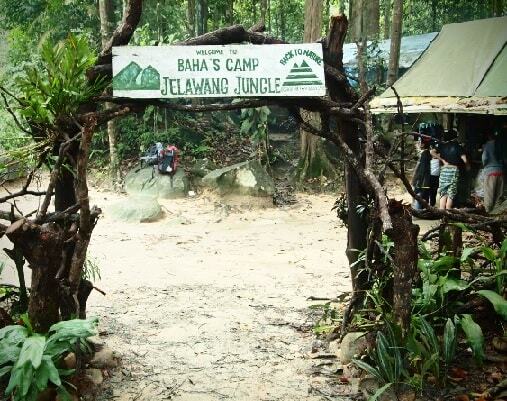 At the top of the Stong Waterfalls is Baha's Camp - a highly prized resting place for travelers with tired legs. Each weary traveler makes in Baha's Camp a pit stop for the night, because the hext day you'll climb the Gunung Stong. There are Baha's Camp six wooden huts and two campsites, which can accommodate 150 to 200 people. From here you can, if you sit on one of the rocks, enjoy the crystal clear waters of the Stong river that plunges over the steep edge down from the mountain. The next morning morning there's floating a thick fog over the jungle, which gives a dreamy effect, as if you can walk over the fog. By noon the fog dissolves and you have a magical view of the lush green valley below. When the night falls and you will be sitting cozy by the campfire, you can hear the mysterious sounds of the Gunung Stong. The next day it's a minute walk from Baha's Camp to the Kolam Tuan Puteri (the pool of the Princess), where you can enjoy a refreshing swim down the waterfall. When you walk about 25 minutes further from Baha's Camp, you'll arrive at the Telaga Tujuh (Seven Springs), a series of smaller waterfalls with several small swimming pools. 1. 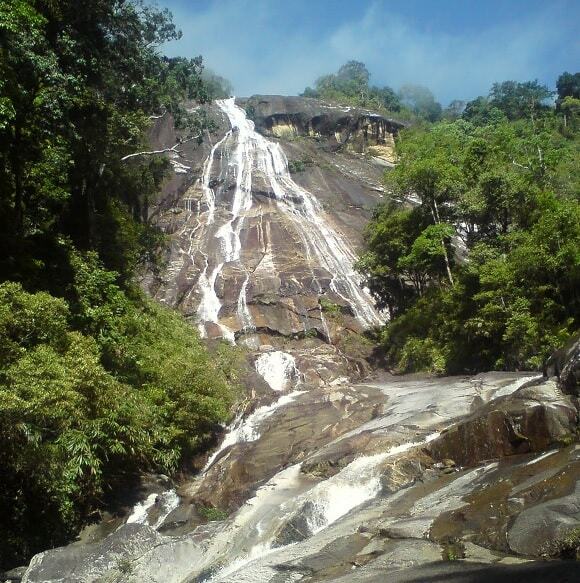 The Y Water Falls, also known as the "Last Waterfalls" where waterfalls of the Gunung Stong and Gunung Ayam, meet. There are legends about those who drink the water will live forever (30 minutes from Baha's Camp). They get eternal youth. 2. Sungai Rantai at Check Point One (1) till Mt.Stong & Mt.Ayam: - you can reach that in a 60-90 minutes walk. 3. Benta Balak at Check Point Two (2) to Mt.Stong & Mt.Ayam: - suitable for bird watching and camping. About 60-90 minutes from Sungai Rantai. 4. Bogo Caves at Check Point Three (3) to Mt.Stong - a cave-like formation by two huge boulders and a suitable resting place for the night on the way to the top of Gunung Stong. River & natural pool just beside the cave. About a 30-45 minutes walk from Benta Balak. 5. Sungai Baha at Check Point Three (3) to Mt.Ayam: - a suitable for resting point (for lunch) before the climb to Mt.Ayam peak. A 60-90 minutes walk from Benta Balak. 6. The top of the Gunung Stong (Mt.Stong), which can be achieved within two hours from the Bogo Caves. 7. Gunung Ayam (Mt.Ayam), ia the highest peak in the area and has a height of 1504 feet above sea level. You'll reach the top after a climb of six hours. It's the ideal place to watch the surrounding and both sunset and sunrise. Pitches are available to overnight. CHECKLIST: Water, backpack, flashlight, sleeping bag, raincoat or poncho, waterproof shoes, headgear, sandals, swimsuit, towel, shirts, pants, shorts, socks, insect repellent, sunscreen, personal toiletries etc.